Read the full Virgin Atlantic article. This profile of Motown was published today (April 22) on Virgin Atlantic‘s blog and summarizes many of the attractions of “The D”. 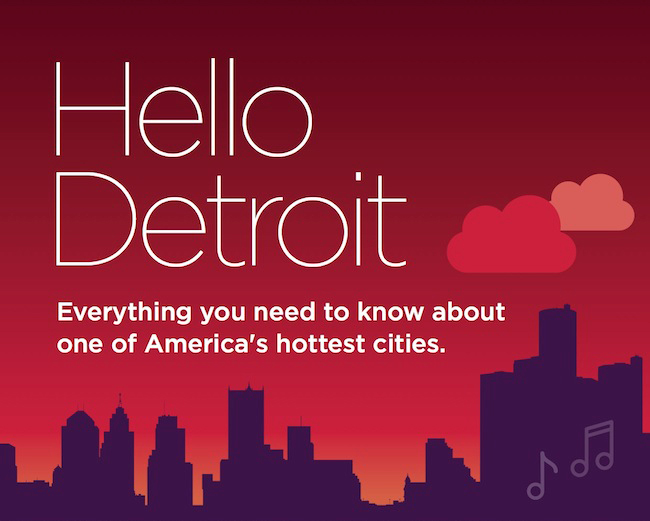 On June 1 Virgin Atlantic will launch direct flights to Detroit, the birthplace of Motown, Madonna and the motor car. Although most commonly associated with Henry Ford and the motor car and Berry Gordy and his Motown record label, Detroit has probably become better known recently for its financial troubles. However, the city has been enjoying a recent resurgence and is once again a hot bed of energy with a burgeoning art scene and new bars and restaurants popping up daily. Read on for a few things you might not know. This entry was posted in Detroit, Downtown Detroit, Eastern Market, Galleries, Greektown, Midtown Detroit, Revitalization, Touring Detroit and tagged Madonna, Motown, Virgin Atlantic. Read the complete MLive article (with the gallery of photos). 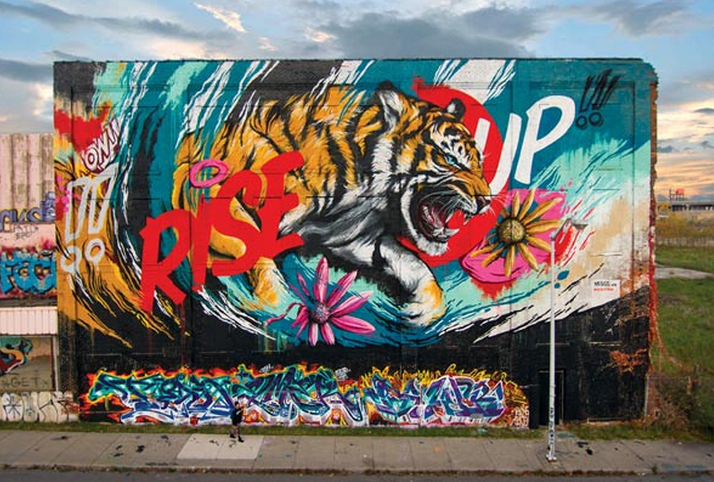 Last week Detroit contemporary arts group Library Street Collective announced that Detroit’s First National Building will soon have the world’s tallest mural on its side. New York-based artists How & Nosm, identical twin brothers, will paint the 26-story piece, which is commissioned by the skyscraper’s owner Detroit businessman Dan Gilbert. The mural will be 354-feet tall, and 81-feet wide, according to Library Street Collective and pay tribute to a mural that formerly graced the building. 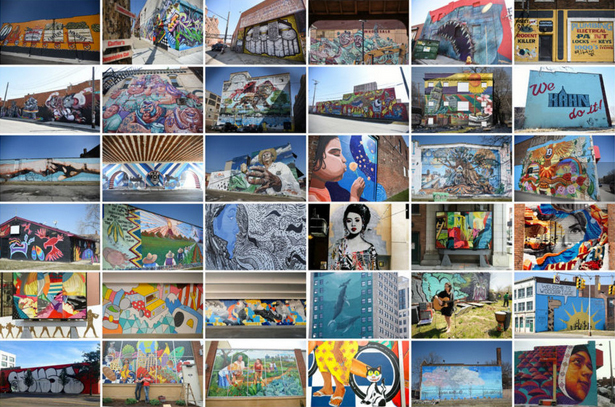 When you visit Greater Downtown Detroit with Show Me Detroit Tours, you’ll see many of the murals show here … and more! For complete info visit www.showmedetroittours.com/reservations.html. This entry was posted in Detroit Photos, Street Art, Touring Detroit and tagged Bedrock Real Estate Services, Grand River Creative Corridor, Library Street Collective. This entry was posted in Touring Detroit and tagged American Express, David Whitney Building, Dimitri Hegemann, Wright-Kay Building. 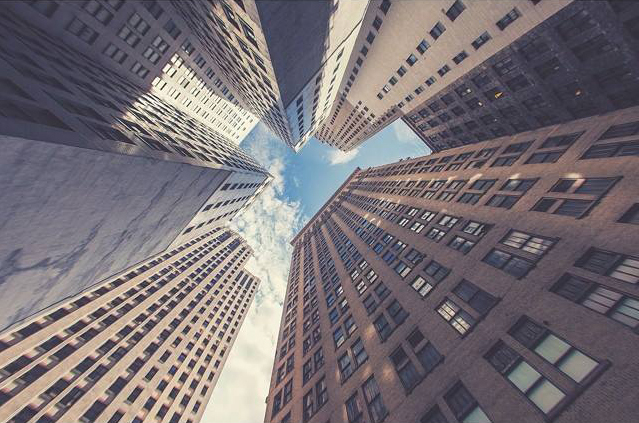 Detroit has so many examples of amazing architecture that stand tall and grand. Some are even designated National Historic Landmarks. Look up, look around, even look down and be wowed. Named in honor of the Penobscot, a Native American tribe from Maine, this art deco masterpiece was built in 1928 in the heart of the Financial District and features Native American motifs. Don’t miss its four-story arched entrance on Griswold Street. 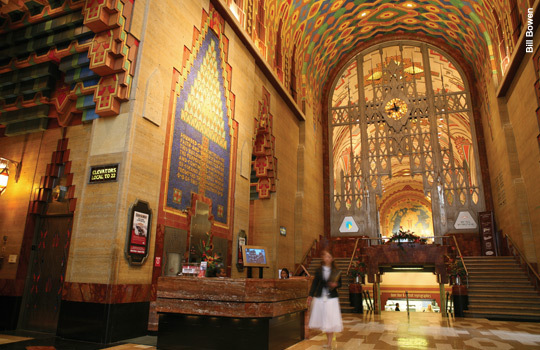 Art deco architecture at its finest, the Guardian Building was once promoted as “the Cathedral of Finance.” Blending Native American, Aztec and Arts and Crafts styles, 40 artisans created the building’s many painted murals and ceilings, mosaics, marble fixtures, tiles and other artistic details. This landmark skyscraper in the New Center area is constructed of limestone, granite and marble and was designed by Albert Kahn Associates. Finished in 1928, it’s considered Detroit’s largest art object and is home to the iconic Fisher Theatre. Classic and lavish, one of the last surviving movie palaces of the 1920s. This impressive grouping of seven interconnected tall towers is a centerpiece of the Detroit riverfront. Designed by architect John Portman, who also imagined the Bonaventure Hotel in Los Angeles, the “Ren Cen” is featured in dozens of movies — This is Spinal Tap, Breathless, Hancock — and TV series. An underwater-constructed wonder that’s also an international roadway connecting the U.S. and Canada. The equally impressive Ambassador Bridge (ambassadorbridge.com) is the world’s largest international suspension bridge and connects the two countries by skyway. This former auto baron’s home was recently designated a National Historic Landmark. Wander 87 acres of sumptuous gardens or tour the inner workings of this 60-room Cotswald mansion. See early homesteads, cottages, farms and shops in Greenfield Village and/or experience the utter architectural awe of a manufacturing plant at its productive best during the Ford Rouge Factory Tour. With 26 buildings, this community is the largest collection of Ludwig Mies van der Rohe’s work. Recently returned to its former glory and now a hotel, look up at copper-covered roof elements and the sculptures of notable figures from Detroit’s history — General Anthony Wayne, Antoine Laumet de La Mothe, sieur de Cadillac, Chief Pontiac and Robert Navarre along the ornate Michigan Avenue façade. By Louis Kemper in the Neo-Renaissance style. Admire the spires of this post-modern Neo-Gothic style, which has the distinction of being the tallest office building in the state. Italian Renaissance style built in 1917. A copper roof and outside fire escape make this towering ruin distinctive. Built in 1913 by Warren and Wetmore and Reed and Stem in the Beaux-Arts style. 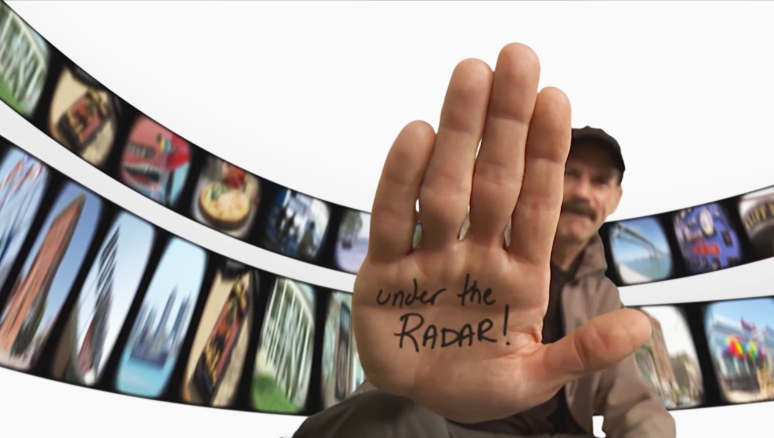 Popular location for Michigan’s film industry. A beautifully ornate example of Beaux-Arts architecture, 1897-1902. A powerful combination of Romanesque and Byzantine architecture. This Gothic-inspired church was founded in 1842. Singer Gordon Lightfoot mentions this place of worship in his tribute song to the sunken Edmund Fitzgerald and once played the famous tune for parishioners during a memorial honoring the sailors lost in the Great Lakes tragedy. Designed by Ralph Adams Cram to serve the area’s Polish community. This entry was posted in Detroit Architecture, Detroit History, Downtown Detroit, Midtown Detroit, Touring Detroit and tagged Book Building, Book Tower, Detroit-Windsor Tunnel, First Congregational Church of Detroit, Fisher Building, Fox Theatre, GM Renaissance Center, Guardian Building, Lafayette Park, Mariners’ Church, Meadow Brook Hall, Michigan Central Station, One Detroit Center, Penobscot Building, St. Florian Roman Catholic Church, The Henry Ford, Wayne County Building, Westin Book Cadillac. 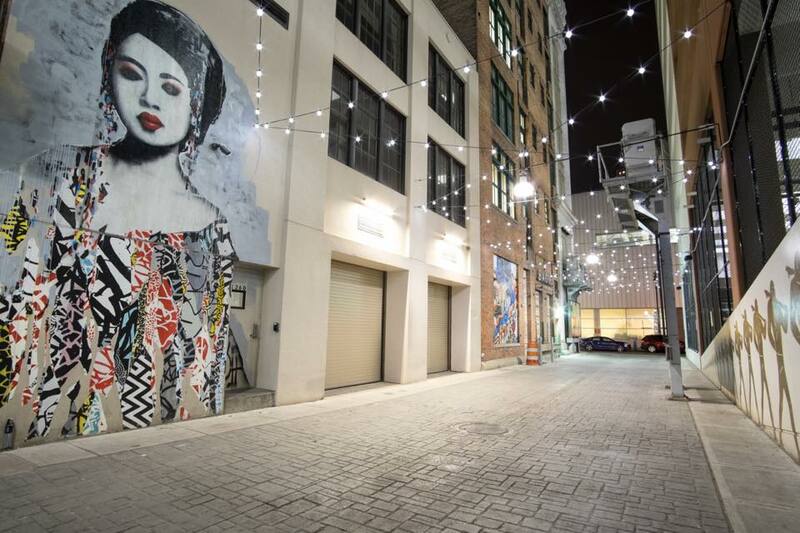 The BELT is an art-filled alley between the two wings of The Z parking deck, located at 1234 Library Street in downtown Detroit. The alley is a joint project of Bedrock Real Estate Services and The Library Street Collective. Show Me Detroit Tours will keep you posted about the next Public Matter exhibition opening on May 22nd. Show Me Detroit Tours likes to show off the alley during its twice daily tours of Greater Downtown Detroit. For reservation info visit www.showmedetroittours.com/reservations.html. This entry was posted in Detroit Tour, Touring Detroit and tagged Bedrock Real Estate Services, Library Street Collective, The BELT, The Z parking deck. The Motor City is revamping, refueling and reenergizing itself with tons of urbanites who want to invest in a better future for themselves, and this great city. You don’t have to look hard to find hard evidence of this great renaissance. And the harder you look … the harder it is to leave once you get here. This entry was posted in Touring Detroit, Video and tagged Detroit Bike City, Detroit City FC, Mudgie's, Northern Guard Supporters, Signal-Return, Supino Pizzeria, Under The Radar Michigan.